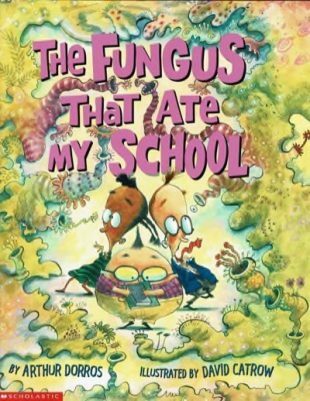 A group of children returns to school after a rainy spring vacation to find that a slimy green, yellow and purple fuzz is covering everything, even the principal’s office. IT’s a fungus! But where did IT come from, and how can they get rid of IT? In the part of the country where I live, the Pacific Northwest, the conditions are often right for fungi to grow. A fungus got my shoe, another started eating its way through my clothes, and there’s a fungus in our basement-my son has been growing it. (That one is contained, though it’s eaten its way through a metal bowl.) Fungi can take many forms, from wispy and cotton-like to slimy, slithery masses. With moisture and a little something for nutrition, a fungus can get growing. Fungus can be serious business. But not in this book. This is a fungus like neither you, nor I, has ever seen before. It has a mind of its own, and the illustrator even has it wearing a cowboy hat as it takes off.